The categories of Natural (including ruderal) and Cultural vegetation are treated as separate hierarchies within the NVC. The new 8-level natural vegetation hierarchy emphasizes physiognomy in an ecological context at three upper levels, and increasingly integrates biogeography and floristics at three middle levels (Table 1). The new middle levels bridge the large conceptual gap between alliance and formation, an important improvement over the 1997 hierarchy. 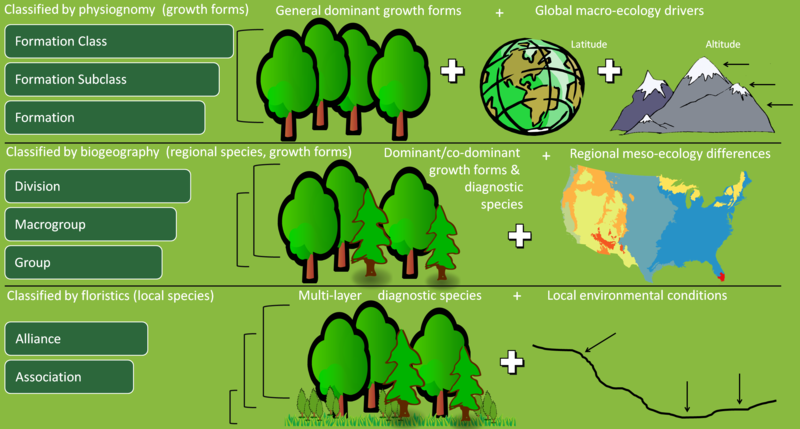 The upper levels of the USNVC hierarchy are based on dominant and diagnostic growth forms that reflect environment at global to continental scales. The mid-levels are based on dominant and diagnostic growth forms and compositional similarity reflecting biogeography and continental to regional environmental factors. The lower levels (alliance and association) are based on diagnostic and/or dominant species and compositional similarity reflecting local to regional environmental factors. The relationship of the new hierarchy levels and classification criteria is depicted in the diagram below. The Standard defines natural (including ruderal) vegetation … as vegetation where ecological processes primarily determine species and site characteristics; that is, vegetation comprised of a largely spontaneously growing set of plant species that are shaped by both site and biotic processes (Küchler 1969, Westhoff and van der Maarel 1973). The following table shows criteria and examples of the levels of the revised National Vegetation Classification hierarchy for natural vegetation. Küchler, A.W. 1969. Natural and cultural vegetation. The Professional Geographer 21: 383-385.